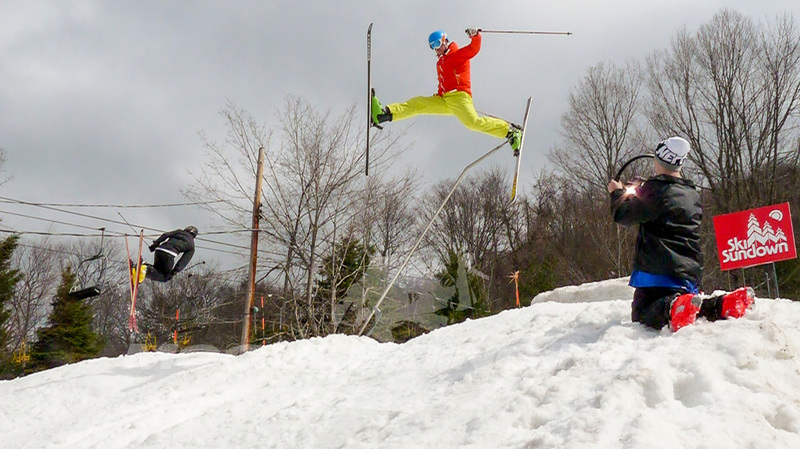 Although winter was basically a non-event in Sourthern New England this year there’s still some snow on the ground at the ski areas and the spring mogul skiing season is in full swing. 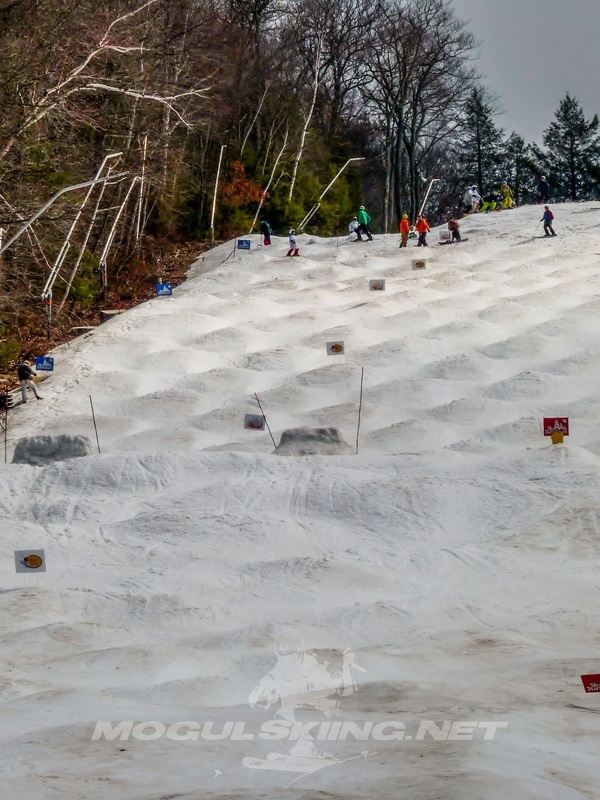 On Saturday, March 17th Ski Sundown in Connecticut held their annual “Bump or Bust” competition in almost 70 degree (21 Celsius) temperatures. Sundown, a small but popular resort in the rural North Western section of the state, made the best of their rapidly deteriorating base in order to host this event which has attracted a loyal and enthusiastic following over the years. Sixty-nine competitors showed up Saturday morning to duke it out on Gunbarrel which had been seeded with moguls a week ahead of time and featured two sets of large kickers. The conditions were variable with the steeper top section of the course featuring some vary large moguls while the final section was considerably flatter both in pitch and bump size. The event was run in a dual elimination format with an additional “consolation” round for the competitors who were eliminated early on. This created four prize categories: Men, Women, Under 18 and Consolation. While the event staff had already shown a great deal of resourcefulness by simply managing to hold the event in such warm conditions they continued to roll with the punches and kept competitors coming down the course almost non-stop once things got going. 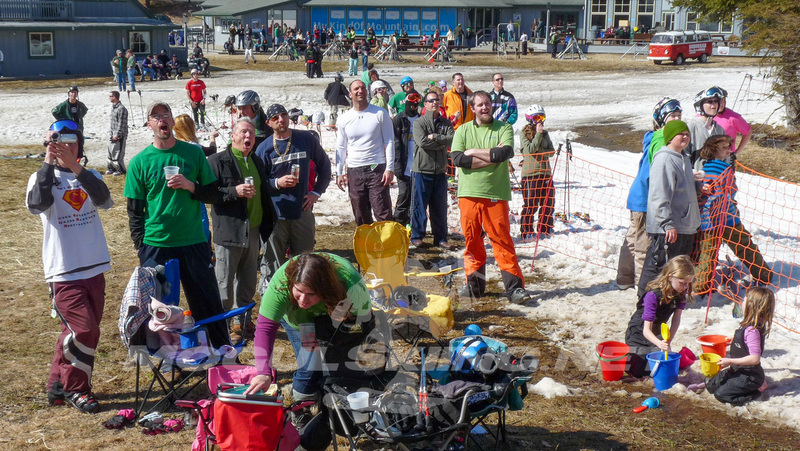 Meanwhile skiers and spectators were congregated at the bottom of the run drinking beer, swapping stories and cheering on whoever happened to be coming down the course at the moment. This, combined with the sunny skies and warm temps created the classic freestyle party vibe which the event has become famous for. Despite the weather challenges this event managed to live up to its reputation as a great time and allowed Ski Sundown to end what must have been a very challenging season on a high note.